Dynamic AX data with other enterprise systems. What Can Xavor’s xEngine Do For Your Business? 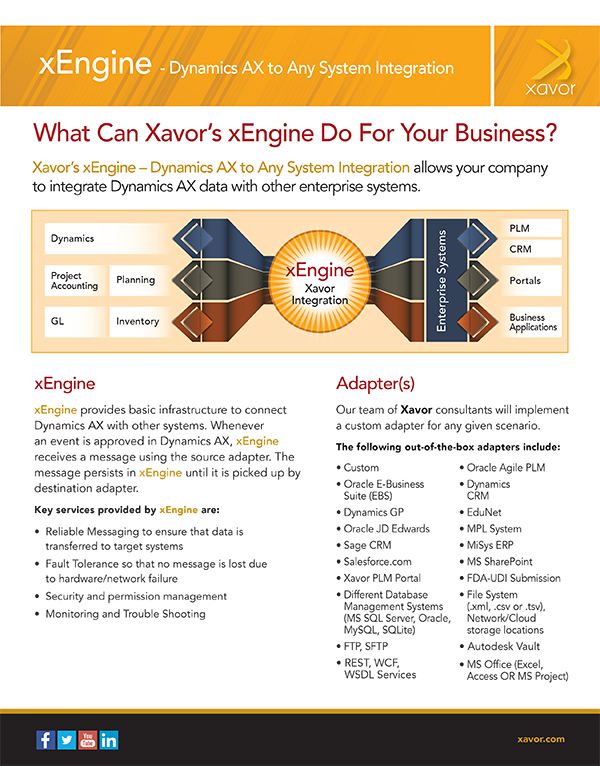 Xavor’s xEngine – Dynamics AX to Any System Integration allows your company to integrate Dynamic AX data with other enterprise systems. xEngine provides basic infrastructure to connect Dynamics AX with other systems. Whenever an event is approved in Dynamics AX, xEngine receives a message using the source adapter. The message persists in xEngine until it is picked up by destination adapter. xEngine provides out-of-the-box adapters to connect Dynamics AX with other systems such as Salesforce.com, CRM, Agile PLM or any other system. Our team of Xavor consultants will implement a custom adapter for any given scenario. xEngine is designed to be extensible. New systems can be integrated and adapters can be implemented without any changes to the core infrastructure. xEngine provides standards-based inbound and outbound interfaces to receive and send messages. xEngine is quick to deploy and does not require complex configurations to make it work. All system configurations are stored in a database repository which can be updated via the web-based administration interface. xEngine maintains key information about message processing and tracks activities by audit log. The Management and Analytics module provides full system visibility using the web interface. xEngine’s modular design enables integrations to scale up to the participating system’s data volume and frequency. Change orders were created in the source system and on release of the Change order, Affected Items and the corresponding BOM were created in AX. As soon as a Quality case was opened within the source System, a corresponding case was created in Dynamics AX using xEngine.